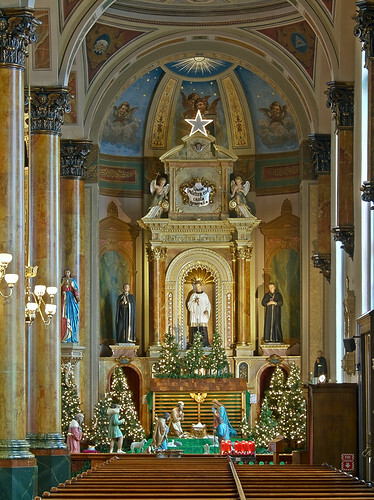 HERE ARE PHOTOS of the Shrine of Saint Joseph, in Saint Louis, Missouri. 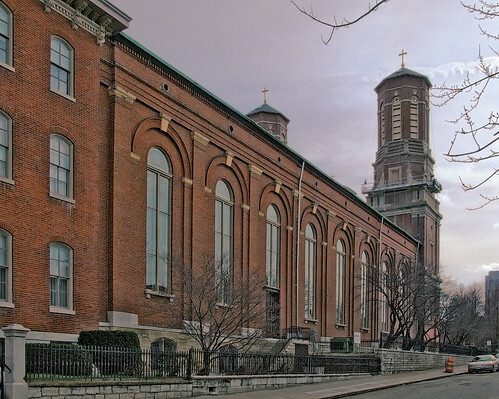 The Shrine is a little more than one road mile northwest of the Old Cathedral in downtown Saint Louis. 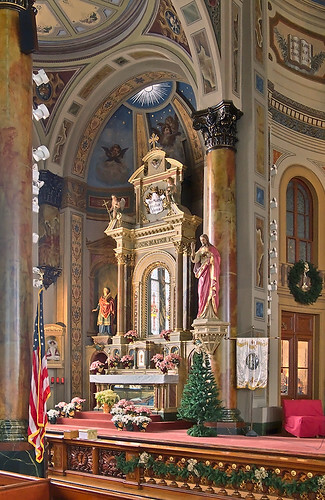 At one time the largest parish in Saint Louis, serving Germans, this is now a shrine. 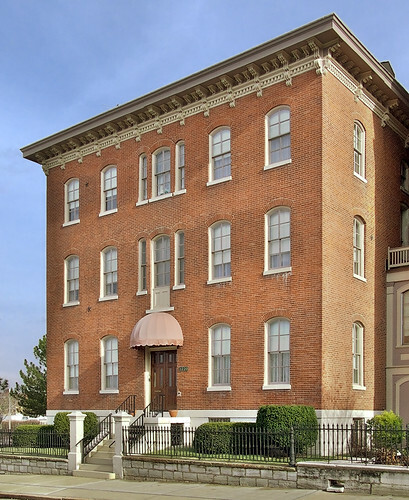 Originally built in 1844, it was dramatically enlarged in 1865-6 and again in 1881. The towers were originally much taller, but were truncated in 1954 for safety reasons. 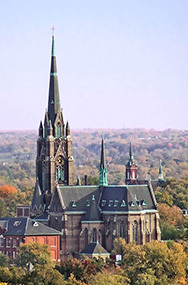 By the late 1970s this church was going to be demolished; but the lay organization, The Friends of the Shrine of St. Joseph, raised funds to restore the church to its former glory. The surrounding area was a dangerous industrial area, but now a neighborhood has grown up around it. A wide angle view of the nave. Click any photo for a larger version. 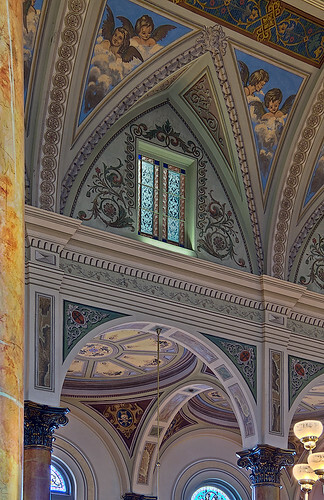 The magnificent Baroque sanctuary. This was taken after Mass, and during a tour, which explains the fuzzy people; they were moving around during the photograph's long exposure time. This is a very popular church for weddings. 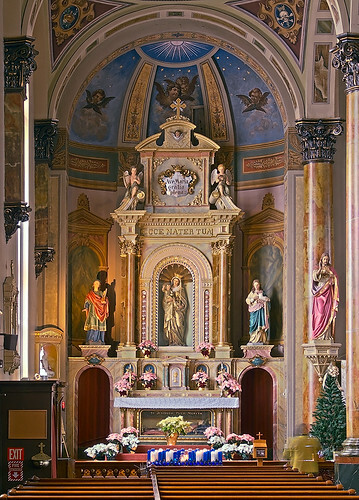 The altar dates from 1867, and its design is adapted from the Jesuit's Gesu church in Rome. 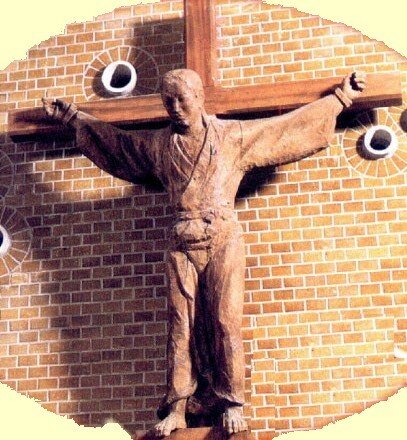 It is inscribed with ITE AD JOSEPH, "go to Joseph". During the cholera epidemic of 1866, the parish had 10-15 funerals per day. Pledging to Saint Joseph to build a monument in his honor, the parish prayed for the end of the epidemic; being spared, they built this altar. 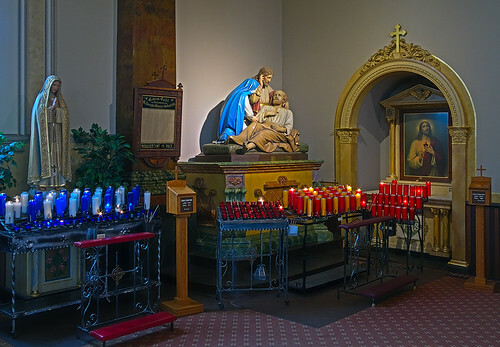 This is the site of the only authenticated miracle in the midwestern U.S. Ignatius Strecker, a German immigrant, who was diagnosed as having only two weeks to live, was immediately healed upon kissing the relics of Peter Claver here. 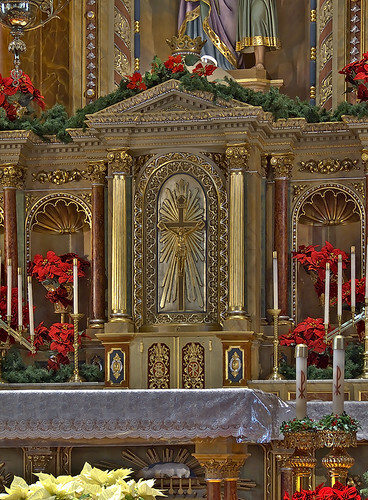 The tabernacle in the high altar. 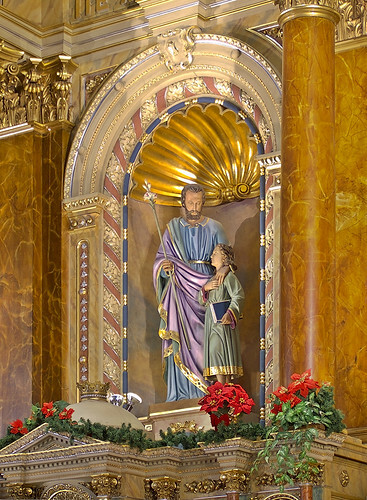 Statue of Saint Joseph with the Christ Child, in the high altar. 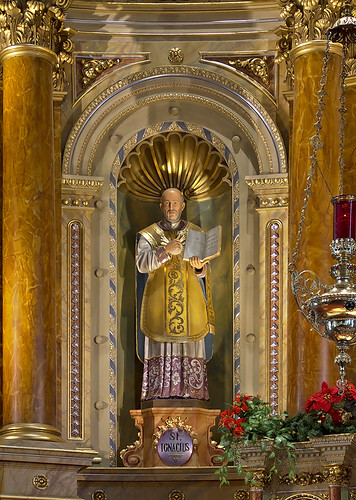 Also in the high altar is this statue of Saint Ignatius of Loyola (1491-1556), founder of the Society of Jesus. This church was originally staffed by the Society. Evangelists Luke (d. ca. 74), with his symbol the ox, and John (d. ca. 101), with his eagle. 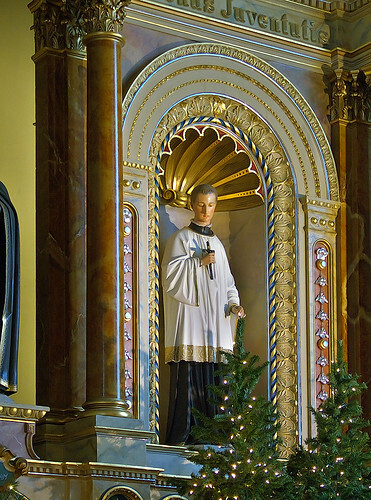 The Jesuit's altar has statues of Saints John Berchmans (1599-1621), Aloysius Gonzaga (1568-1591), and Stanislaus Kostka (1550-1568), all of whom died young. Inscribed in Latin is Patronus Juventutis — patron of youth. 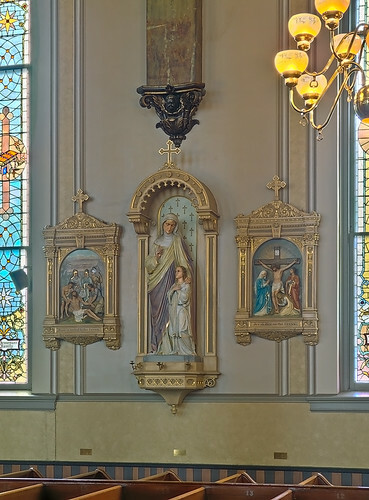 This altar was to inspire boys to the priesthood. 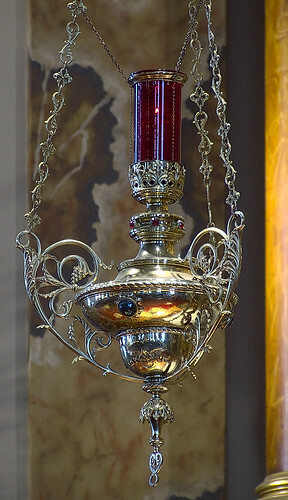 At the top is Quam pulchra est casta generatio — How beautiful is the chaste generation (Wisdom 4:1). Below the altar mensa — hidden by the manger — is an effigy of Christ in the sepulcher. Saint Aloysius died after tending to plague victims. Mary's altar is to the left of the high altar. 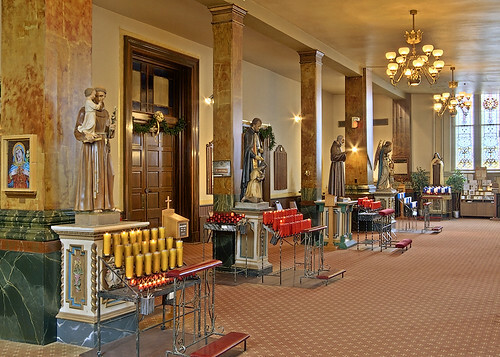 A statue of Mary and the Infant Jesus is flanked by statues Saints Cecilia (martyred ca. 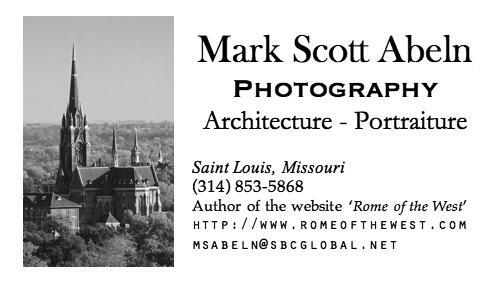 117) and Agnes, Roman virgins and martyrs. 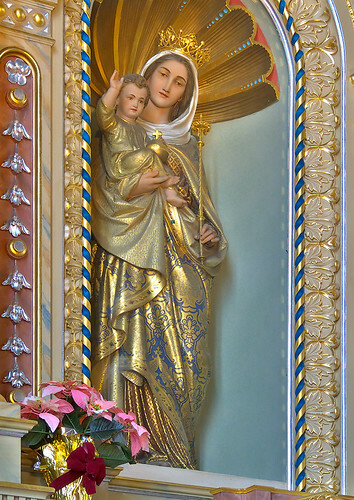 Statue of Mary and the Infant Jesus. 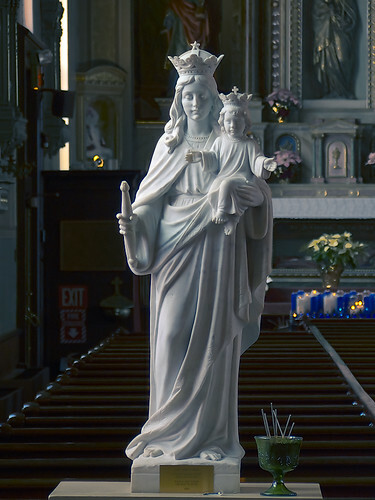 This has to be the most beautiful statue of Our Lady that I've seen lately. Saint Agnes of Rome (d. 254 or 304), was executed after refusing the order to sacrifice to pagan gods and to lose her virginity. "On her feast day two lambs are blessed at her church in Rome, and then their wool is woven into the palliums (bands of white wool) which the pope confers on archbishops as symbol of their jurisdiction." 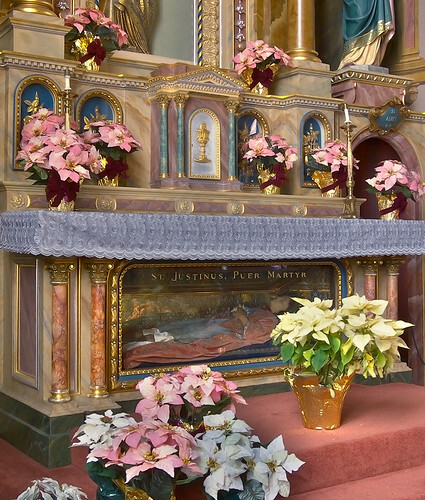 Below the mensa of Mary's altar is an effigy of St. Justinus, Puer Martyr. Saint Justus of Beauvais (a.d. 278 - 285) was executed during the persecutions of Diocletian. 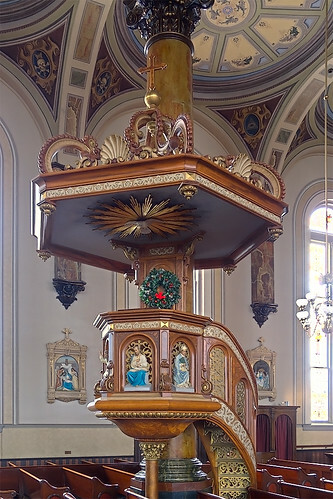 This pulpit was hand-cut by a Jesuit brother. 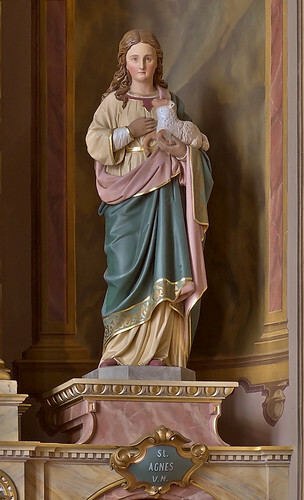 Statue of Mary and the Infant Jesus. Stained glass window has the Eucharistic symbols of wheat and grapes. 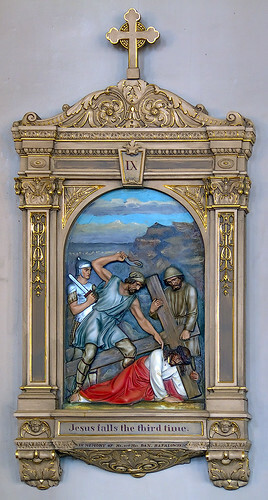 IXth Station of the Cross: Consider how Jesus Christ fell for the third time. He was extremely weak and the cruelty of His executioners was excessive; they tried to hasten His steps though He hardly had strength to move. 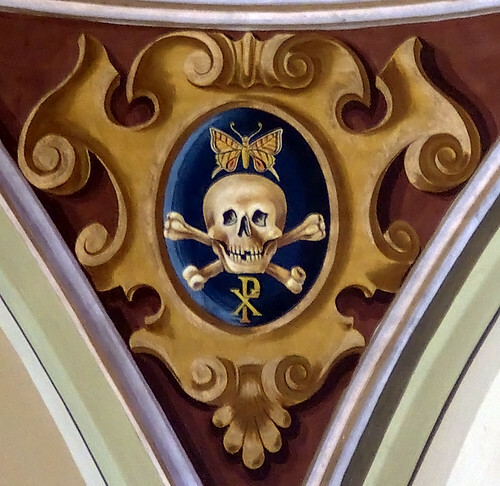 The Skull and Crossbones is not just for pirates, but also for Catholics. A butterfly surmounts the skull; the Greek translation of butterfly, psyche, also means 'soul'. That a caterpillar enters a burial shroud-like chrysalis, before emerging in glory as a butterfly, makes this a fitting symbol of resurrection. 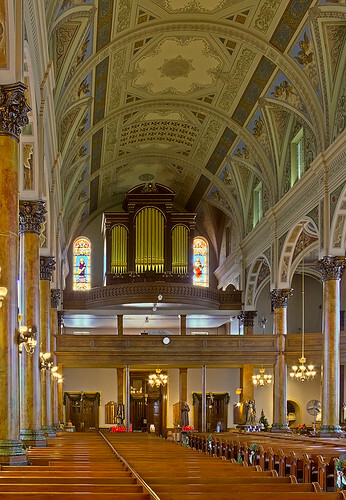 According to the shrine's website: The Pfeffer organ was installed in 1890. 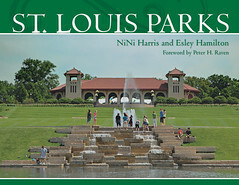 It was built on Marian Street in St. Louis by George Pfeffer. In eary 2002 the organ was totally rebuilt by the Martin Ott company. 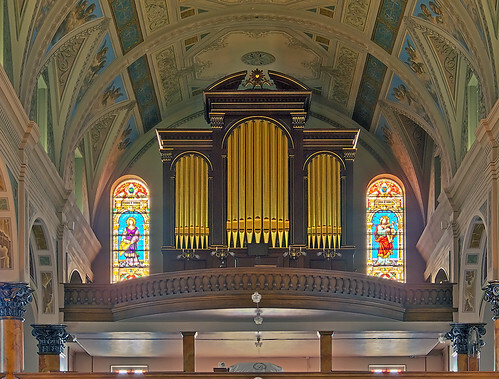 The organ has 1895 pipes, with almost 300 made of wood. Devotions in the back corner of the church. 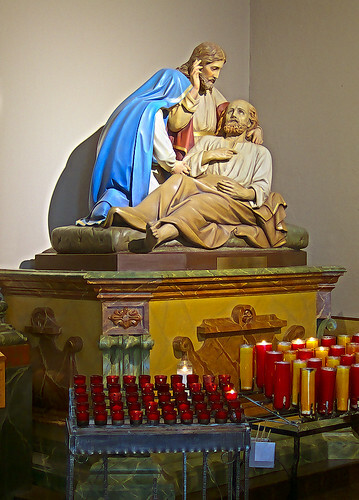 The holy death of Saint Joseph. 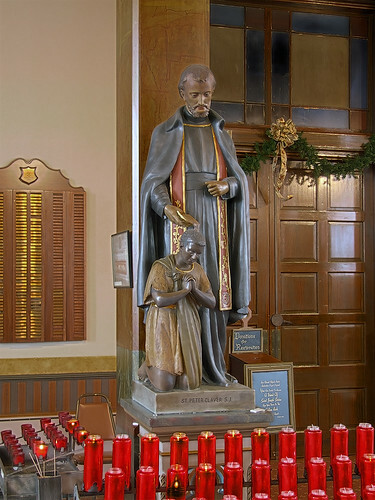 This statue of Saint Peter Claver (1581-1654) was given by descendants of Ignatius Strecker, whose miracle led to Peter's canonization. 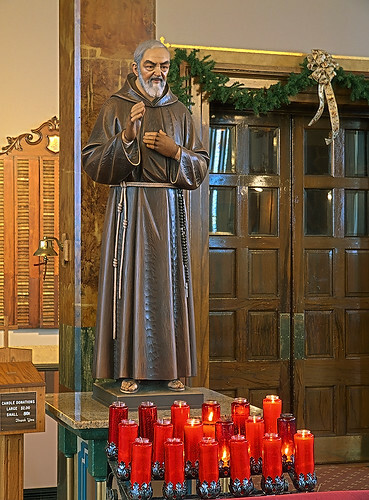 Statue of Saint Pio of Pietrelcina — Padre Pio — who foretold that the young Karol Wojtyla would one day be Pope. 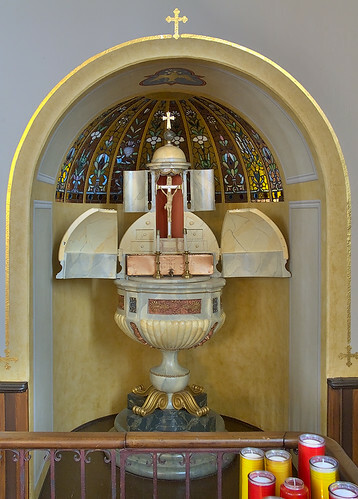 The very elaborate baptismal font. The Shrine's rectory. 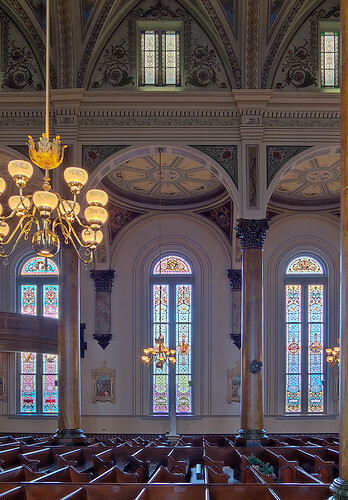 It is very nicely decorated inside. Click here for my photos of the Shrine from 2006. Thank you for the magnificent post. 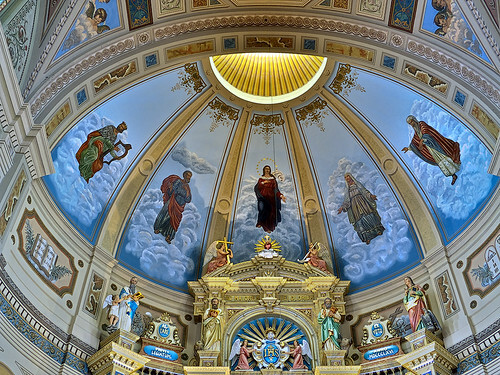 The Shrine is an awesome testament to Christ. The Glory of our Savior is magnified by Jesuits at St. Joseph's Shine! It is quite a beautiful shrine. Absolutely beautiful. Did you know that a lot of Italians go down there quite often, especially on the Feast of St. Joseph. 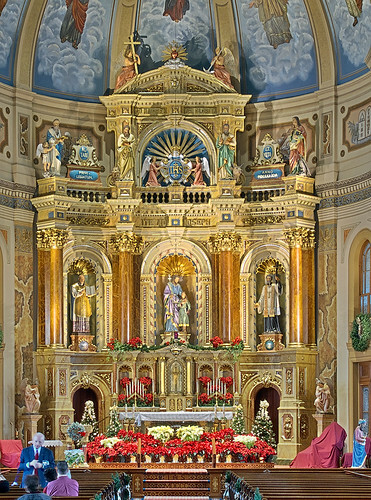 Mass according to the Extraordinary Form is at 9:00 AM each Sunday at the Shrine of St. Joseph. 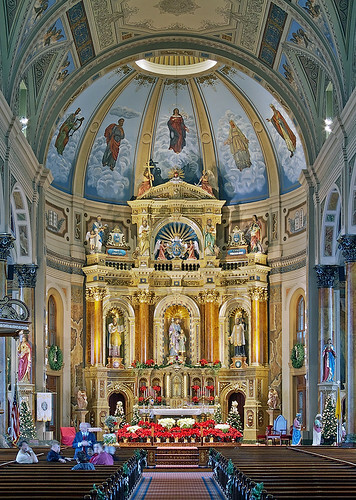 This Mass was instituted in July 2008. The celebrant is Reverend Martin D. O'Keefe, S.J. All are welcome. It is said on Mary's altar. Mass according to the Ordinary Form is at 11:00 AM on Sundays. The skull is a masonic symbol. You failed to document the eye in a pyramid that's just beside the skull. 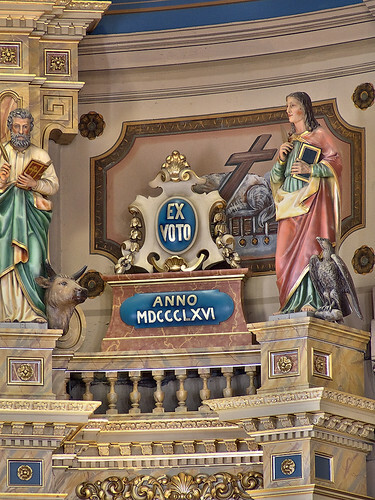 These symbols were left by the builders of the church, and they're not Catholic, they are Luciferian. They were Catholic symbols long before they were adopted by the Masons, and are orthodox in character, not occult. Awesome! Greetings from France. God bless! Patrick. My cousin, Fr Rochelle, SJ was pastor here.